In large bowl, stir all Cookie Base ingredients until soft dough forms. Press dough in bottom of pan using floured fingers. Bake 15 to 18 minutes or until edges are light golden brown. Cool completely, about 30 minutes. In small bowl, stir frosting, milk and peanut butter until well blended. Spread over base. Stir jam; drop by teaspoonfuls over frosting. Swirl jam for a marbled design with tip of knife. Refrigerate 20 minutes or until set. For bars, cut into 9 rows by 4 rows. 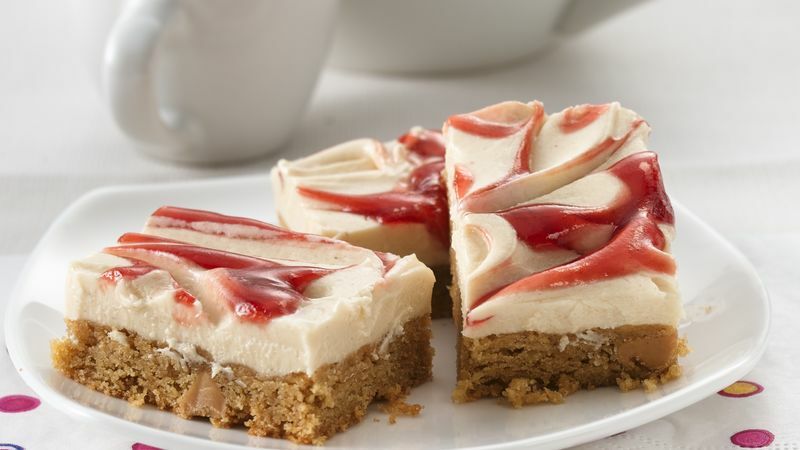 To swirl jam into frosting, use a narrow knife, toothpick or small metal spatula. Use crunchy peanut butter if you prefer crunch.